We are about to remodel our kitchen- nothing too major, just new countertops, a new backsplash and a nice coat of paint on our maple cabinets. I’m thinking we’ll go with white or greige paint on the cabinets. I was really glad to see that you all still love white cabinetry. So, my next question is on subway tile. Is this another classic that just happens to have oversaturated the blog reader’s psyche or is it a trend that we need to move away from? 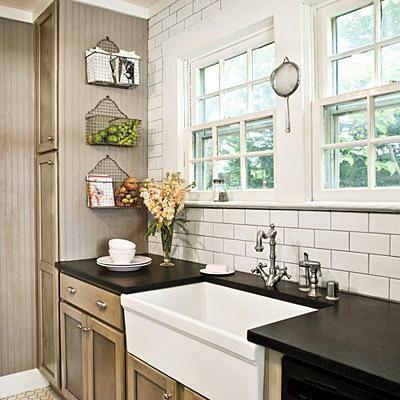 What are your thoughts on subway tile- love it or leave it? Love it! Without a doubt! It's a classic! Investing in classic elements is always a smart choice. You save money because you don't have to renovated any time soon. Have a wonderful day, Paloma. Still love subway tiles! I think they're classic. Is there a special kind of white paint that's best to use when painting wood cabinets? I love it. I'm British and see it as being so archetypally American. I want it for my kitchen. Love it. It's classic - keeps a modern kitchen grounded. Love it love it love. Its a classic for a reason! Still love it. I want my backsplash and firplace in marble subway tiles - in a herringbone pattern. A classic. A classic that can be re-interpreted and freshened up in so many ways from the color, the texture, how it is installed to how it is grouted. Lots of staying power here...good luck with your remodel, can't wait to follow along! LOVE it girl!! You can't go wrong. I especially love the 3rd image. Very cool. I still like subway tiles. I used marble in a guest bath and I love that interpretation for a kitchen as well. I love it, and am currently redoing our bathroom this summer with it. I think it's classic and great for a home with a "clean" palette. I still love, although my heart lies with chevron. I love it and plan to use it in my house real soon hopefully! This was one job that didn't get done before we moved into our farmhouse and has been put on the back burner. I think it's a classic! I like it for the clean lines, but right now the blogosphere is so overly saturated with this that I'm not sure I would choose it. ADORE it. My sister just redid her kitchen and it looks strikingly similar to that last picture. A lil marble, a lil subway tile, clean lines, white...what's not to love. i never thought that i would like grey on a kitchen! 100% here to stay! It is a definite classic! LOVE IT for sure. There's a reason it's still around after all these years. It can be contemporary or vintage, subtle or bold. So versatile! Agree- LOVE IT! So classic, timeless, and clean. Beautiful! Subway tiles are classic for a reason, it's beautiful, timeless and versatile, especially marble subway tiles. The first kitchen is gorgeous by the way! I'm sorry, but I disagree! I would like to swap my tiny galley kitchen in my tiny London flat for one of these kitchens. In fact I would happily live in any of these kitchens especially the first one. Divine! Love it. Paired with white upper shelving and dark lower cabinets, I think it strikes the perfect balance between classic and fresh. Love it! Classic, clean, and a fabulous background for other design elements. Both of my bathrooms are white subway tile walls with white honeycomb tile floor. Good Luck, can't wait to see the results! I love them! We have them in our kitchen and I NEVER look at them and wish they were different. I can't even think of what else we would have used. I will try and send you a picture! I love subway tiles- though none of the photos you posted really represented how good they can look. I think one of the most important things with subway tile is picking the right counter tops and making sure you down light it. Subway tiles can look fabulous and timeless you just have to do it right- and they get used poorly all the time because people think oh it's timeless and classic how can I go wrong...well they can. White subway tiles with dark counter tops or white subway tiles with white counter tops(not gray marble but white) are a fabulous way to go...make sure to down light it- its all in the lighting. I didn't think I would like it much but these pictures are wonderful! So, I change my mind. I am all for it! Love the white on white. Love it! It will never go out of style. I keep thinking one day I'll tire of it but it's still my favorite. There are so many versions now. I think it's a classic that is here to stay. Subway tile is like a strand of pearls or a LBD. Timeless. Phew! So glad everyone still loves it, cause I just put them up in my own kitchen. Not only are they classic and pretty, they can be kind on the wallet if you don't have a huge budget!! You'll never tire of it... Always a classic! I am still a fan... yet can't decide if i will use them in my next kitchen since I have them now! I've got an Edwardiam flat in London and the bathroom runs off the kitchen, which is standard in the area I live so I had subway tiles put in my kitchen and bathroom to keep the continuity, I still love them several years later! It's safe. It's basic. It's a little boring. I don't love it but I don't not love it. I think it's a lot better than doing some dinky little accent row, but not as great as a full expanse of handpainted tiles could be. Love it! will be installing it in my kitchen shortly. if you love it..then do it, you will regret it if you don't. Love it! There are other, beautiful options, obviously, but it's a classic that will always be with us, with good reason! Subway tiles have been around since 1904 so I don't think they're going anywhere, but if you want to use them in a way that's a bit more unique than what we're seeing splashed all over the magazines and blog-o-sphere, feel free to look at my post on "10 different ways to use subway tile"...I sketched out some new patterns like a Herringbone or a Vertical Offset Joint that you might find interesting. Those images are beautiful of the kitchens and I'm with you subtle veining is best.